Mohammed Al-Bakri from Gaza’s Union of Agricultural Work Committees points out the "no-go" zones for Palestinian fishers and farmers. Credit: Eva Bartlett/IPS. GAZA CITY, Sep 29 2012 (IPS) - “From the coast to eight miles out, the sea is like a desert: it’s sandy and there are no fish.” Mohammed Al-Bakri traces a thick line on the wall map before him, following the lines of Gaza’s eastern and northern borders, continuing south from three miles off the coast. General manager of Gaza’s Union of Agricultural Work Committees, Bakri is well-versed in the woes of the Strip’s fishers and farmers. He explains the insufficient fishing waters Palestinians are limited to, and the consequences of being on the sea at all. “The Israeli navy attacks the fishermen, arrests them and takes their boats, even within three miles,” he says, referring to the three-mile limit the Israeli authorities have unilaterally imposed on Palestinian fishers. Under the Oslo accords, Palestinian fishers are authorised to fish 20 nautical miles into Gaza’s sea. The Israeli authorities have illegally downsized Palestinian fishing waters, using lethal violence to enforce new fishing limitations. On a given day, Palestinian fishers are subject to Israeli navy machine gun fire, shelling, water cannoning, and abductions. “When the fishers are arrested, they just have a boat and a net,” says Bakri. “No weapons, they are just trying to catch to sell at the market, to earn money for their families. “More than 500 fishers have been arrested and at least 12 killed by the Israeli navy,” says Mohammed Al-Bakri. 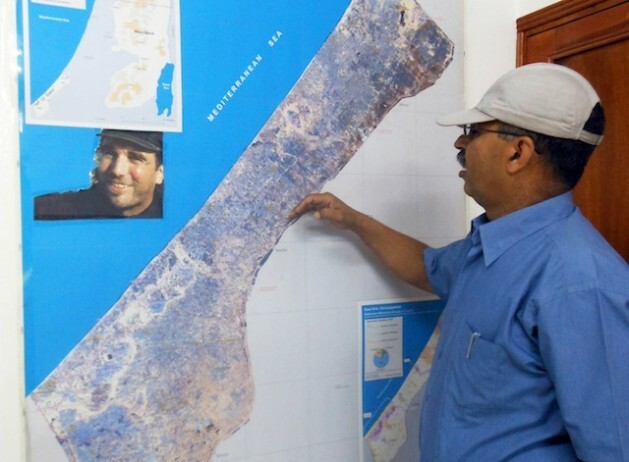 Bakri refers back to the red line on the UN map of Gaza marked ‘Areas restricted for Palestinian access’. Imposed unilaterally by Israeli authorities, the “buffer zone” officially bans Palestinian farmers and civilians from the 300 metres of land flanking Gaza’s eastern and northern borders. In reality, the UN, international NGOs, and Palestinian organisations have documented Israeli soldiers’ targeting of Palestinians even as far as nearly two kilometres from the border. “Shooting at people accessing restricted areas is often carried out from remotely-controlled weapon stations…every several hundred metres along the fence, each containing machine guns protected by retractable armoured covers, whose fire can reach targets up to 1.5 km,” reads a 2010 UN report. Via machine gun fire, shelling, flechette (dart) bombs, drone attacks, land razing and setting crops on fire, the Israeli army has rendered one-third of Gaza’s agricultural land deadly and inaccessible. Palestinian farmers continue to face Israeli attacks as they attempt to farm their land, for the majority their sole source of income and food for their families. “We need political support internationally, to pressure Israel into allowing farmers to work their land and fishers to access their sea,” says Bakri. Heeding his call, and hoping to build “connections of mutual solidarity between Canada and Palestinian farmers and fishers,” a Vancouver-based group aims to broaden political support via their Sep. 30 ‘Day of Action For the Fishers and Farmers of Gaza, Palestine’. “This particular aspect of the siege is quite compelling because when a society is deprived of the ability to fish and to farm, it is deprived of its ability to sustain itself. It’s part of the ongoing Nakba, and part of the ethnic cleansing of Palestine,” says Charlotte Kates, a lawyer and one of the Day of Action coordinators. Kates and a delegation traveled to the Gaza Strip earlier this year, meeting with Palestinian fishers and farmers. Building cross-Canada and international alliances with Palestinian farmers, fishers and civil society is the Vancouver group’s focus with its Day of Action. No less important is changing Canadian policies regarding the siege of the Gaza Strip. “We want to build a movement that can challenge the Canadian government on these policies, policies which predate the Harper government,” Kates says. Canada is not alone in endorsing the illegal siege on Gaza – what Desmond Tutu and UN special rapporteurs John Dugard and Richard Falk, among many others, have called collective punishment. “Last month, the European Union decided to increase their support with Israel,” says Mohammed Al-Bakri. The Sep. 30 Day of Action will take place in cities across Canada, with “rallies, vigils, the launching of the book ‘Freedom Sailors’, and leafletting,” says Charlotte Kates. The day of solidarity with Palestinian farmers and fishers has the backing of, among others, Independent Jewish Voices, the Simon Fraser Public Interest Research Group (SFPIRG), and former Vancouver city councillor Tim Louis.